Yesterday, I finally got to play a game of Sharp Practice 2. I had refereed a game last summer but had yet to play. Myself and Mike got together at the Hobby Bunker to play an 1811 Napoleonic game. I believe Mike has played several times and has put on games at various cons over the last 6 months so he was pretty acquainted with the rules. It took me a several turns to get them down but about half way through the game I was pretty comfortable with them and the game moved quickly. 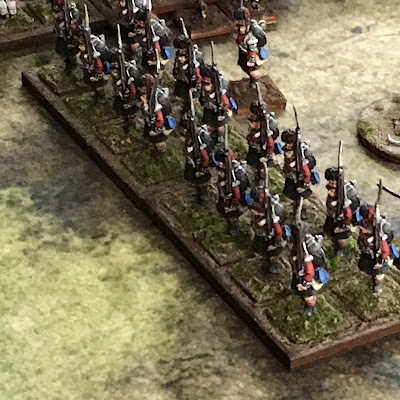 Mike has a very nice British force table ready and is getting a French force painted, I also believe he is painting up both sides for the Indian Mutiny. 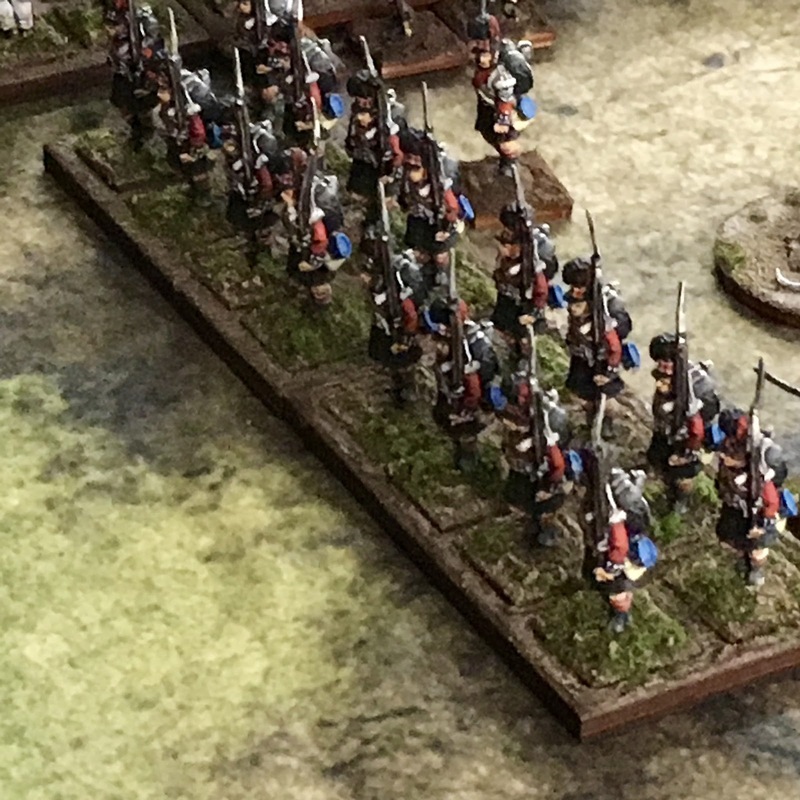 I had to supply the French, it was a bit of a scramble to get ready as although I had some residual troops left from my major 28 mm Napoleonic sell off, they were not based. It was interesting as some of the figures were some of the first I painted 10 years ago when I was starting out in the hobby. They were pretty rough, hopefully I will get around to touching them up. Mike's troops were spectacular mostly Front Rank painted by Dan Dunbar, of Gunnar's Wargaming in Australia. 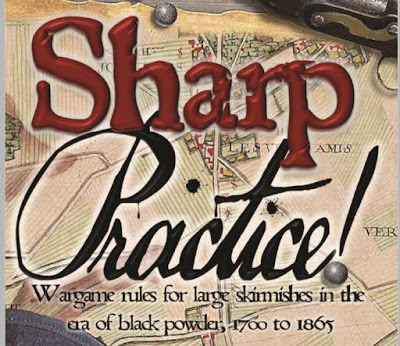 This will all work out well for future games as I do also have a pretty good British force, so for Napoleonics anyway we will both be able to supply our own figures for a variety of games. I always have felt that I play best with my own troops! Mike brought all the terrain and the mat which was quite nice. 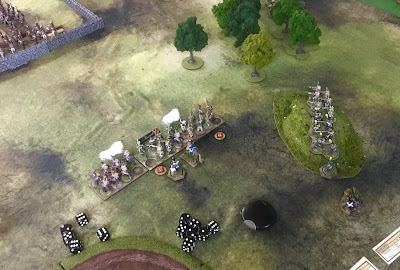 We played scenario 1 from the book which is a straight forward encounter between two forces with victory to the side which forces his opponent off the table by withdrawal or morale failure. We diced for Force Morale and Supports, we were both 10 on Force Morale and I had 10 supports and Mike 9. I believe Mike's core force was 62 points and mine 61. My supports included a Musician, and extra fixed deployment point and a group of Kirmess Voltiguers. Initial dispositions, I place my line troops in a single 3 group formation and 2 groups of skirmishers to my right flank. 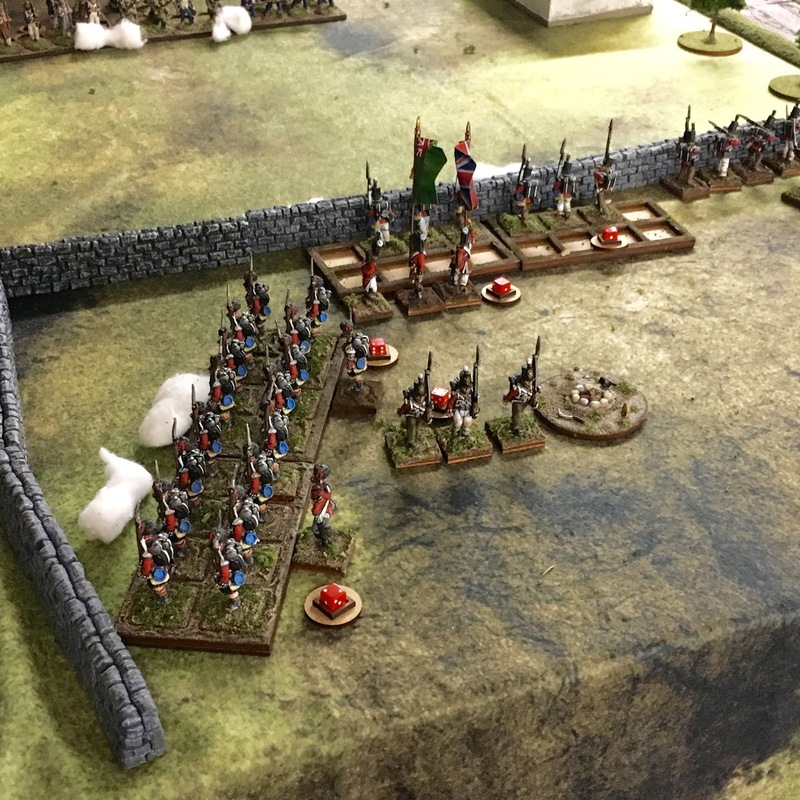 Mike place 3 groups of his line troops in formation behind the wall. 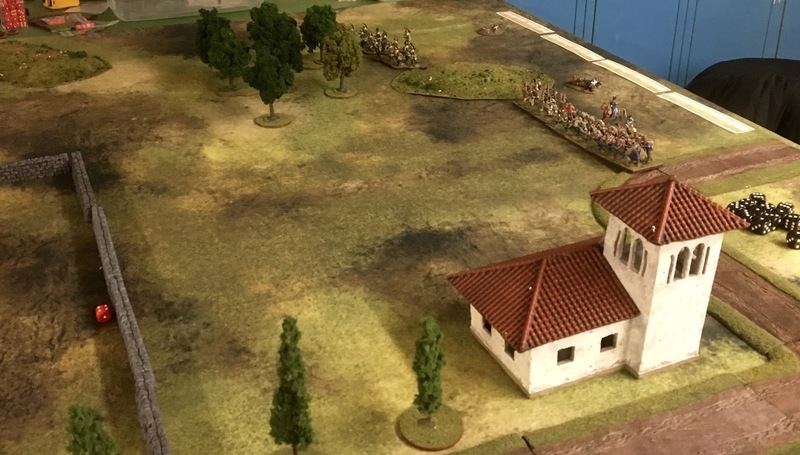 I decide to send my skirmishers to the right in an attempt to flank Mikes troops. They run so take a shock for each group. 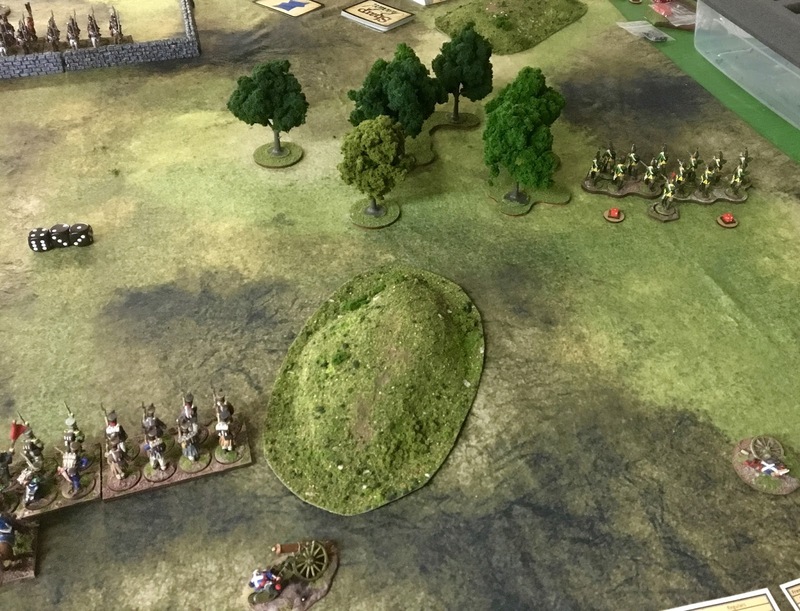 Mike brings on his Highlanders to protect his left flank. A firefight opens up in the middle between our line troops, I am lucky with my dice, Mike less lucky with his. I think Mike had little better card play than I, his command cards appeared regularly and his leader cards popped up with more regularity than mine. We also found that the tiffin card came up severally in the first 3 draws, so we had quite a few turns. I cleverly place my third formation of skirmishers on a hill so they can fire over my line troop's head but alas I was not so clever as they were out of range. 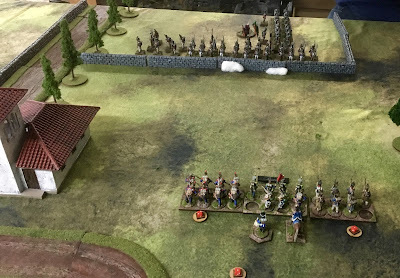 I slowly advance my troops with the hope that by the time we engage in fisticuffs, I have whittled down the British line and inflicted lots of shock. 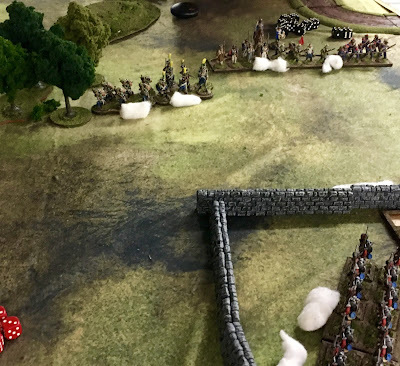 Mike brings on his skirmishers on his right flank. .............it works as the British line starts to crumble, one group withdraws, the other 2 are teetering and although the British Highlanders and Light Infantry are largely intact, the French have punched a hole through the British centre and the British withdraw. A French victory. Well I have to say I quite enjoyed the game, it certainly appears to have little less complexity of command choice than Chain of Command, but just as much friction. They say the game is a meld of Chain of Command and Dux Brit, taking the best from each game; I can only agree. I will look forward to more games.